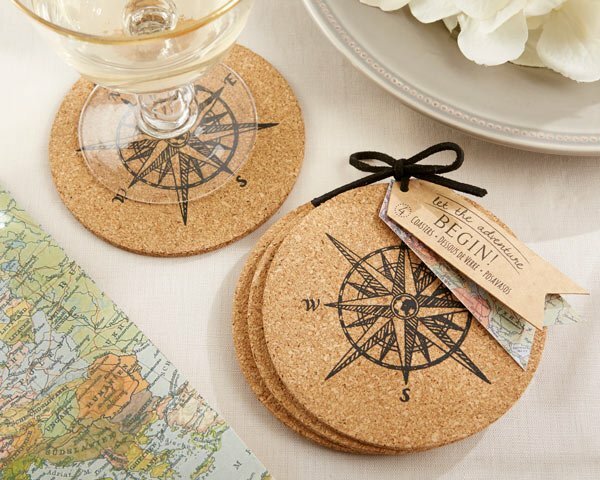 Your guests may be traveling from all over to celebrate you as your journey begins so commemorate this amazing day with lovely "Let the Journey Begin" Cork Coaster Favors. The design fits well with travel themed, vintage or destination weddings. Set one at each table setting for a worldly touch or send them home with your guests as a thoughtful "thank you" gift. 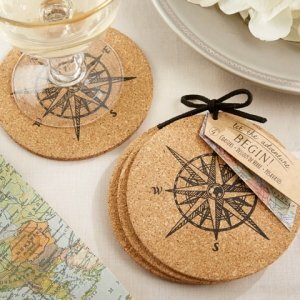 Each circular cork coaster is printed with a black compass design and packaged for easy gift giving. Each gift set includes 4 coasters attached with a black suede cord. Are you able to personalize with a name and/or date? I'm sorry personalization is not available for the Let the Journey Begin Cork Coaster Favor. Do these coasters come with the journey tags as well? Yes, this Let the Journey Begin Cork Coaster Favors include the tag that says "Let the Journey Begin" as shown in the picture.